Green Olive Tours Blog • Palestine • Israel: Israel's "Foreign Workers"
Israel is a country consisting to a large extent of former refugees and immigrants. At the same time Israel does not consider itself an immigration country – as far as non-Jews are concerned, of course. Walking through Tel Aviv's South however, will certainly give you a completely different impression. More than Hebrew and Arabic, you will hear Rumanian, Spanish, Yoruba, Thai and many other languages. 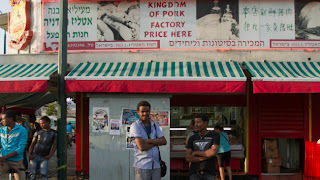 Israel is home to an estimated number 200,000 people, who came here for work and possibly for a better life. Since 1967, with the occupation of the West Bank and Gaza, Israel's economy increasingly relied on cheap Palestinian labour. At the same time, as already mentioned in another article on this blog, the purposefully underdeveloped Palestinian economy started depending on workers seeking employment in Israel. With the outbreak of the First Intifada the Israeli army started imposing closures on the West Bank and Gaza and Palestinian workers could not reach their work places any more. In addition to that, the 90s were characterised by a separation policy, which among other things was supposed to eliminate Israel's dependence on Palestinian labour. All of these policies did not diminish the demand for cheap labour. which therefore needed to be supplied from other countries, mainly from Rumania, Bulgaria, China, from Thailand and the Philippines. As a self-declared non-immigration country, that is always concerned about its demographics and the maintenance of the Jewish character of the state, Israel had to find ways to prevent the migrants from permanently settling down and to ensure that the “foreign workers” would eventually leave again. 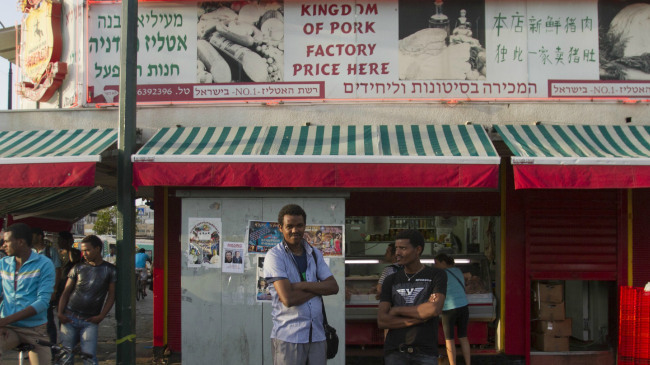 Residence rights in Israel for non-Jewish migrants are tied to work permits. The permits are however not granted to the migrants themselves but to their employers, to whom the worker is therefore indentured, usually for a fixed duration of one year. Most of those contracts are established through agencies in the migrants' home countries, to which the migrant has to pay an additional fee. This condition of maximum control of the employer and the state over the migrant worker prompts plenty of opportunities for exploitation and abuse through the employer, and has often been denounced by Israeli and international NGOs as amounting to slavery. According to reports many employers do not fulfil their legal obligations to the migrant workers; they receive less than minimum wage, are not paid for overtime, do not receive any of the social benefits they are entitled to under Israeli law, and frequently work under bad and dangerous conditions. The workers themselves usually do not dare to complain, fearing their employers could end the contract, which would turn them into “illegal” migrants. Migrant women, most of who work in unregulated areas, such as domestic care, are especially vulnerable to different forms of abuse through their employers. Apart from the documented workers, there is a large number of “illegal” undocumented migrants living and working in Israel. 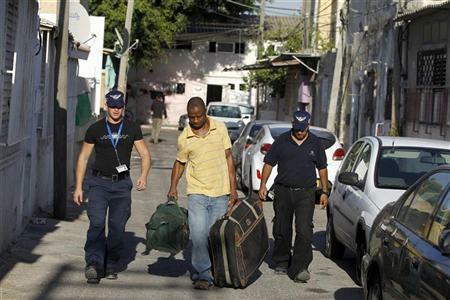 Many of them had originally entered the country as tourists, or on a work permit and had then overstayed their visas. Although they constantly have to fear arrest and deportation through the “Oz” unit, a special police task force, established for the sole purpose of dealing with unwanted foreigners, many undocumented migrants contend that they can live more freely than those indentured to their employers through a work permit. In order to combat “illegal migration” Israel started preventing migrant workers from entering the country if they have relatives from their immediate family in Israel, as this would supposedly increase the chances of the workers overstaying their visas. For a while pregnant migrant women and women with children, whether documented or undocumented, felt that they were less likely to be held up, yet the immigration authorities soon also started specifically targeting them. According to a regulation, which was fortunately struck down by Israel's Supreme Court in 2011, migrant women could lose their legal status due to pregnancy, and were thus essentially forced to choose between their visa and a child, giving them three months to send their infant to their home country. 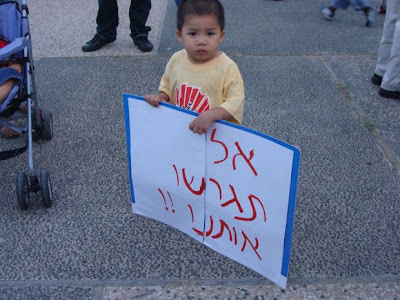 Filipino boy at protest: "Don't Deport Us"
In 2009 the Israeli government first announced its plan to deport some 1200 children of non-Jewish migrant parents, who were born and raised in Israel. After a major public outcry the deportation of the children was postponed. A year later the government came up with a set of new criteria for naturalisation of migrant workers' children, including being born in the country, speaking Hebrew, having studied the year prior in Israel and being enrolled in the Israeli education system for next year. Hundreds of families applied, many were rejected and others are still waiting for an answer from the authorities. Until today Israel does not recognise the rights of those children who spent most, if not their entire lives in the country. Former Minister of Interior Eli Yishai supported their deportation on the grounds that they were “liable to damage the state's Jewish identity, constitute a demographic threat and increase the danger of assimilation.” Those sentiments are unfortunately also to some extent mirrored in the population at large, which increasingly blames “foreigners” for the country's social and economic problems. Until today Israel has not come up with a clear, consistent and fair policy to deal with its nonJewish migrant population or with the tens of thousands of African asylum seekers, all of who have to live under the constant fear of being arrested and/or deported.